How about this for a test of Arsenal’s “cojones”? Stepping into the furnace of one of Europe’s most intimidating venues, with a collection of kids and first-team misfits, they emerged with three of the most satisfying points to provide the strongest answer to the criticism that has poured down on them since their pitiful defeat at Watford. In many ways, winning in this manner will taste sweeter than if they had cruised to a three-goal victory. Arsenal had something to prove tonight: they had to dig deep, to show their mettle. They duly did just that, eventually claiming all three points through a stunning overhead kick from Olivier Giroud. Jack Wilshere said Watford captain Troy Deeney was wrong to question Arsenal’s character in the aftermath of their meltdown at Vicarage Road. Deeney was not the first to do so, and will not be the last, but here was a statement of intent from Wenger’s side that will surely restore some much-needed faith across the club. And what a valuable experience this would have been for the likes of Joe Willock, Ainsley Maitland-Niles and the brilliant Reiss Nelson, who shone from right wing-back. There will also be encouragement from the performances of Mathieu Debuchy, making his first appearance since November 2016, and Wilshere, who continues to impress whenever he plays. 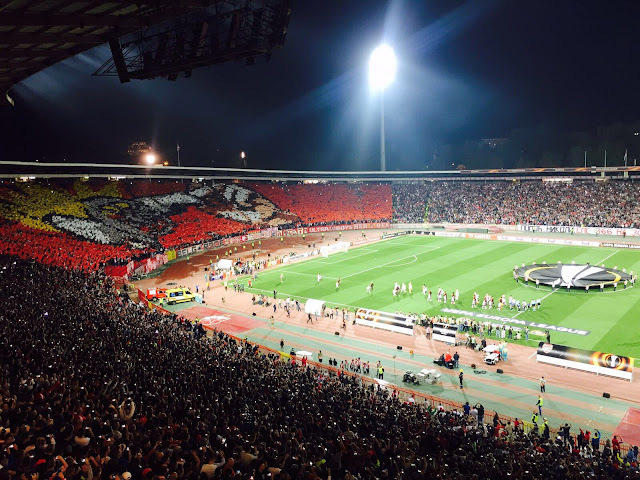 The thumping, jumping Rajko Mitic Stadium, nicknamed the ‘Marakana’ for its febrile atmosphere, was ready for the occasion almost an hour before kick-off. Red Star’s glory years, which included a European Cup triumph in 1991, have long since passed, so the club were not going to pass up on a welcome opportunity to remind a modern-day European giant what Serbian football - and its fans - can still produce.